I have tried 4 obstacle course runs (mud races, whatever you want to call them) in the past 3 years, which I have decided means that I can officially pass on some words of advice on this topic. 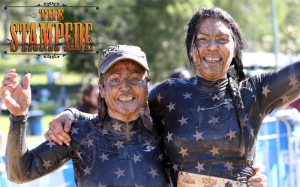 This photo of me and mum at the finish line of The Stampede in 2014 was used in their marketing campaign for the 2015 Stampede! Obstacle course runs are great for beginners or people who can’t run very well like me, because you aren’t timed (ie you can walk it without shame) and even those who are super fit can only run in short bursts due to the intermittent stopping and waiting to get through an obstacle. 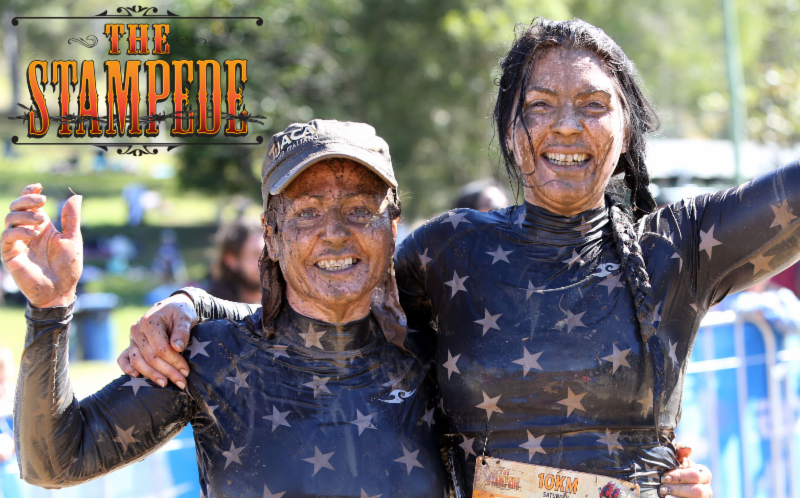 I haven’t done a ‘Tough Mudder’ but certainly my experience of The Stampede is that it’s not set up to be ultra-difficult in terms of fitness. The obstacles are mostly mental obstacles and challenges, that pique your fear and adrenaline and give you a wild sense of accomplishment when you make it through. 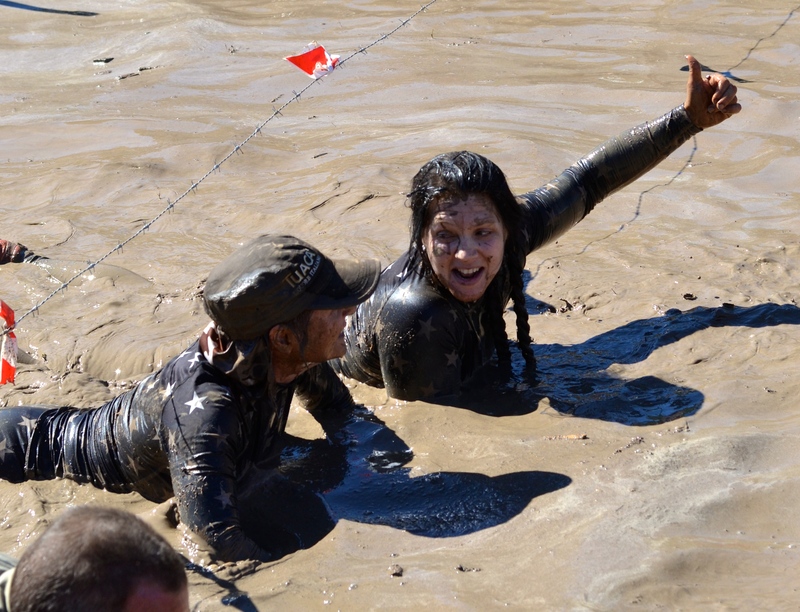 Things like crawling through a plastic tube in mud and water, which makes you feel very claustrophobic but can be achieved by a wide variety of people if they have the courage to try it. Or running through a cage with dangling wires that send 10,000 volts of electricity through your body if you get hit. You don’t need to be physically fit to do that, just a bit crazy! Sign up for one now – they are great fun and make you feel alive! You get a free beer at the end too! 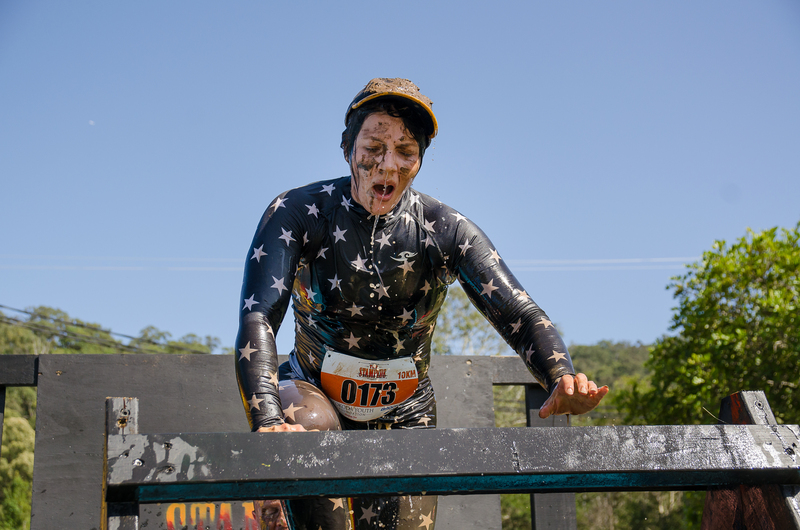 Try and register for a start time that is earlier in the day so that it’s not too hot, you know that you have heaps of time to complete the course and the queues at the obstacles wont be too long. Do enough training that you will at least enjoy walking the distance of your chosen course. You don’t need to be able to run it, but if the distance is easy for you then you can focus on the adrenaline pump you get from completing each obstacle rather than feeling worn out from walking ‘x’ kilometres. The Stampede comes in either 5km or 10km options. Wear synthetic materials that don’t hold water (causing painful chafing). I have run all my races in ‘compression gear’ that I got off Ebay very cheaply. If it looks silly on you, that is a bonus. If you look like a serious racer you will stick out like a sore thumb at these things! 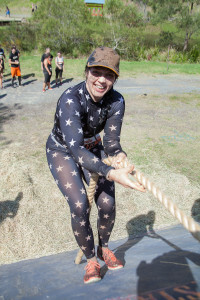 I am considering doing my next obstacle course in a full costume and I would still wear compression gear underneath to protect my skin from scratches and bruises, as well as reducing the chafing. Wear a hat if you are in QLD because even in winter (when most of the races are held) the sun will make you feel ill after a couple of hours. Be prepared that you will probably lose the hat half way around the race but you’ll feel half as bad as the others who didn’t have a hat at all. Wear shoes and socks that you can either throw away afterwards or wash and know that they will never be the same. Washing your shoes does ruin the support in them, so they wont be very good to run or walk in after the big day. Find someone to do the course with who you can chat to and laugh at. If you’re out there for a couple of hours you want to know your buddy will give you a leg up over the climbing walls but also throw mud at you when you get stuck in the tyre pit and laugh. If your partner is roughly the same energy level as you, that will help too. Drink lots of water and have a good snack like a banana just before you set off for energy. Smile the whole way round, especially when you see spectators, a person with a camera or a really scary obstacle. You will get wet and dirty, and probably love it! Q. How bad is the electrocution? A. Thinking about how bad it will be is the worst part of the electrocution. That moment where you are getting your run-up to the cage and you’re bracing for imminent electric shock, that is the worst part. If you do get hit (I once ran through and didn’t get zapped at all!) then it is like someone smacks you really hard in that area and then the pain is gone. If it gets you in a joint (I got zapped on the knee this year) then that can be pretty weird because your joint might go numb for a few kilometres. But the exhilaration when you realise you’re out the other side is incredible- high-fives all round! Q. Do you really think anyone can do this? A. The only thing you need to do this, is a desire to do this. I did a 5km obstacle course run with my 78 year old Grandpa and if he can do it, you can at least try! Q. Do you have to do all the obstacles? A. No, there is no judgement, no forcing people to do things they don’t want to do, only kind, helpful, fun-loving people the whole way round who will clap and cheer you as you walk right past the obstacle if that’s all you want to do! When I did the course with Grandpa, one of the obstacles required you to crawl on your hands and knees which Grandpa couldn’t do, so we skipped it together and clapped some other people that were crawling along. Bear in mind that you can attempt an obstacle as many times as you want. And if you really enjoy an obstacle, why not go around and have another go?! You go first Mum, so I can laugh at you! If you are still not convinced – let me tell you that at The Stampede in Brisbane they have the absolute most fun, best and exciting water slide that you’ll ever encounter. It is awesome and the joy of doing that is worth any pain from electrocution, mud baths and climbing things!